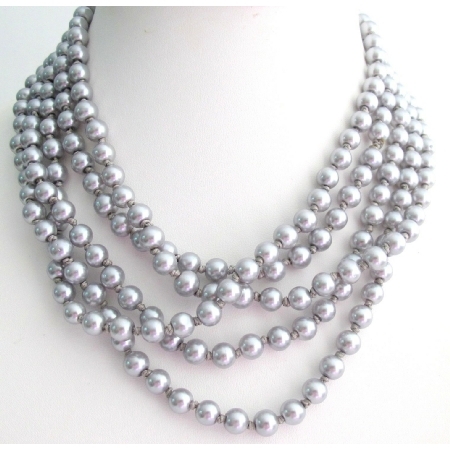 Ancient Pearl Long necklace for winter or wear with Sweater long Silver Gray Long Necklace 100 inches Pearl Statement Necklace Magnificent Pearl Necklace with hand knotted after each pearl Multi Strand Pearl Necklace. Would be wedding traditional necklace for Bride or Bridesmaid. This lovely Silver Gray pearl necklace has been hand knotted with Silver Gray silk thread & is finished off with a gorgeous quality elegant & feminine. Pearls are the perfect choice for any occasion. Worn in so many ways 2 or 3 or more necklace strand or tie a knot the way you like.